This free supplement clocks in at 6 pages, 1 page front cover, 1 page editorial, so let’s take a look! We begin this pdf with a one-page introduction of the origin of the class. 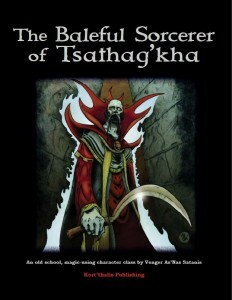 The baleful sorceror gets d6, may not wear armor and are proficient with daggers, short swords, sickles and scimitars. They may also use poison as a thief of the same level and may rebuke, command or destroy undead as a cleric of the same level. This sorceror learns one spell of a higher level every level, though more power can be gained via trafficking with dreaded Tsathag’Kha, putting that control in the GM’s hands. The sorceror may also try to cast more potent magic than he can, requiring a save. If he fails, he takes the Constitution-drain of the magic himself and is whisked away by Tsathag’kha’s servants to be looted and/or forced to sign a pact in blood. This power obviously needs some balancing: Baleful Sorcerors of Tsathag’kha can never acquire a familiar, multi-class or be lawful/good. Upon death, his soul is forfeit and there is a 7% chance that the sorceror rises as a lich after dying. These guys do not require spellbooks. Aforementioned Constitution-drain either is equal to the spell-level or as noted in the spell’s description, but these may be relegated to willing and unwilling targets, provided blood was drawn by the sorceror, and no more than 1 hour prior to the casting. Constitution recharges at 2 points per hour of uninterrupted rest, but characters below Con 3 must save to avoid systemic shock and subsequent death from the recovery. The spell-list runs the gamut from magic detection (rolling a bunch of spells into one) to infernal conducts, blackish-purple tentacles, green, ichorous infernos and insta-kill at level 9. I wished the spells had more detailed casting/duration-infos, but ultimately can live with what’s here. Editing and formatting are top-notch, I noticed no significant glitches. Layout adheres to a nice two-column b/w-standard and the pdf has no bookmarks, but needs none at this length. The pdf has a damn cool b/w-artwork in addition to the full color cover. Venger As’Nas Satanis provides a solid, nice character kit here; by virtue of the rules being designed to work with several iterations of OSR-rules, the crunchy parts are a bit less precise than what I personally enjoy, but ultimately, the class works with a minimum wok required – and that is pretty impressive. Oh, and it is FREE. FREE is hard to beat indeed and hence, I will award full 5 stars + seal of approval in spite of this minor nitpick for this pdf – well worth the download! You can get this nice little class for FREE here on OBS!